here it is a week later from my last post. yes it actually did work! i did all my homework and had a postive attitude about it (even though there was a lot!). i even did my homework today (saturday, which i never do!) anywayys yea im gonna try to keep it up! so theres nothing really that interesting going on in my life right now...cassies going to have her baby any day now! thats exciting! but thats about it. boringgg. bye! it has officially hit me. the second semester is here. yea i know, its been here for 3 weeks but i haven't been paying attention. i have been really lazy and tired all the time. normally when i have homework i will work on it and not go to bed until i'm done, but for these last few weeks i've been like half way through my math homework and i'll just be like "oh i'll do it when i wake up." YEA RIGHT. another thing is that its getting harder. thats half the reason why im not doing it. i get it, but since its getting harder it requires more work, which i dont feel like doing. so tomorrow is monday i am making it my goal that i will get all my homework done this week and hopefully for the rest of the year! wish me luck!!!! Pic #1 is a pic of everyone staying in the Haddock home. There is 3 extra people in this picture so that makes 20 people! 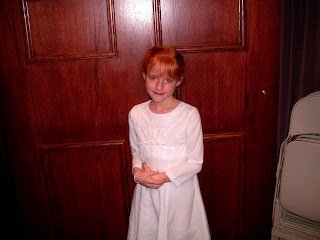 Pic #2 is my cute neice Lindsay in her baptism dress. the title pretty much explains my trip. yes it definatly was. try 17 people living in one house? actually that doesnt sound that bad....anyways lets start with the drive. 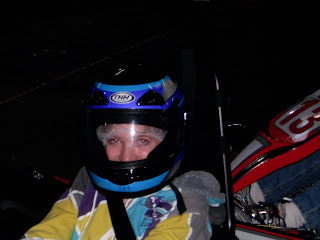 ok before i start this week full of activities im going to say all the people living in the house while we were there. tracie, my oldest sister, her husband darren, porter (13), mason (10), lindsay (8), spencer (5), tanner (11 mos. 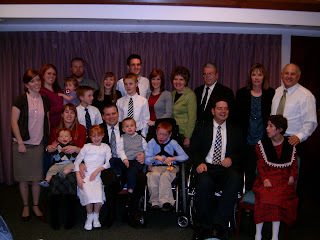 ), darrens dad dave, his mom ellen, his brother larry,his sister cassie, my mom, my dad, me, dallin, justin, and kayli. count em! we arrived at the house at approx. 7:00 am. hugs all around! that day was basically the day where we settled down and relaxed. i stayed up pretty late with porter. he didnt inform me that church was at 9:00 the next morning. sunday- i slept in until 8:20. so i had about 20 minutes to take a shower, get ready, and eat. i did all that except for the eating part. so i get to church and i realized that my shirt was on backwards!! it wasnt that bad though because it was just a plain black long sleeved shirt. i changed it back after sacrament meeting. 7 hours later is lindsays baptism. i had to do a musical number with kayli, cassie, and allison (another of darrens sisters). 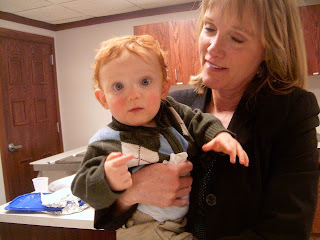 the baptism was nice and had yummy treats afterwards. we also took a huge family pic. wed- new years eve was a day that was planned for playing games and eating which is basically what we did. of course we played super smash bros, but we also played other games. that night i went with porter and his friends to a hockey game. it was kinda weird cuz i was the only girl, and the other girls that were there didnt even pay attention to me. so i was stuck with the boys. when we got home we played trivial pursuit (love that game!). we just stayed up till 12 said happy 2009 and thats about it, not that special. thursday- sleep in day of america as i say. darrens family had left early that moring so since we all were sleeping no one really told them good bye. later, me, tracie, mom, justin, and kayli went to payless to get some shoes. i couldnt find any i liked though. later, we drove to kansas city again. we went to this place called crown center. it is a big mall that has a nice hotel hooked onto hit. yea i said it a mall and nice hotel. i was in heaven! i want to stay there sooo bad! so when we got back to the car and started driving to a restaurant i felt sick. like stomach sick. i was dying, well not really but still. we got to the burger place and i laid down. i felt horrible. then i ran to the bathroom and threw up. i felt a little better after that. after everyone ate, we went to liberty jail. i stayed in the car and laid down cuz i wasnt feeling good. i was getting cold though so i went inside. it was a cool place and you could see where joseph smith actually was. after that we had to drop kayli off at the airport. i threw up again in a cup. sorry this is probly grossing you out. when we got home i threw up again, twice. we watched a movie then i was in bed. friday- i woke up feeling better but my body was sore for some reason. we packed up our things, said bye to everyone, and left. this day was spent driving the whole time. we arrived home at 3:30 in the morning. this time it took us 19 hours. 5 hours less than last time, not so bad. well thats about it, it was a very fun trip! no snow though, i was hoping for that. anyways, i hope i didnt bore you all to death with this ultra long post. i'll post pics later.